A collection of autographs from John Candy. "Oh how i miss John. As many friends and fans know John was a gentle giant. He was one of the nicest people out there. In 1991 he bought into the Cfl's Toronto Argonauts. This was his dream. He did something as far as I know no professional sports team owner has ever done. 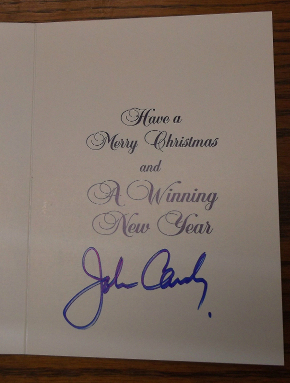 He sent card's to the season ticket holder's of the team and basically thanked them all. And he signed it personally. 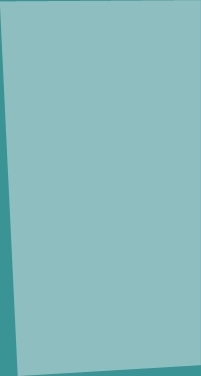 Here is a picture. What a classy gentleman." "I was a limousine chauffeur on the night when this 'Official Programme' guide was obtained from John Candy. 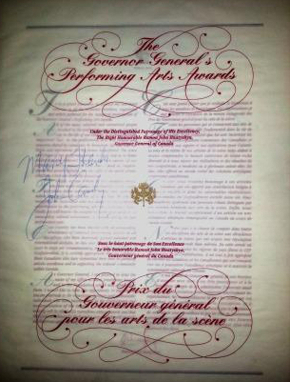 John Candy was attending the 'Governor General's Performing Arts Awards' in 1992 Ottawa, Ontario Canada." 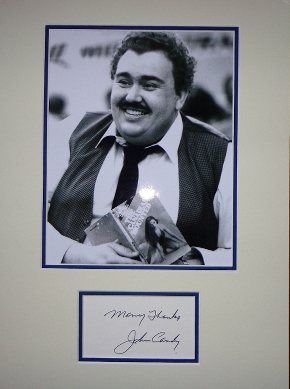 "I would like to contribute my autograph signed by the one and only John Candy. I am very happy that I have it in my possession. Bought it from a known autograph seller a half year ago. I only need to get it framed, but will do that soon :) "